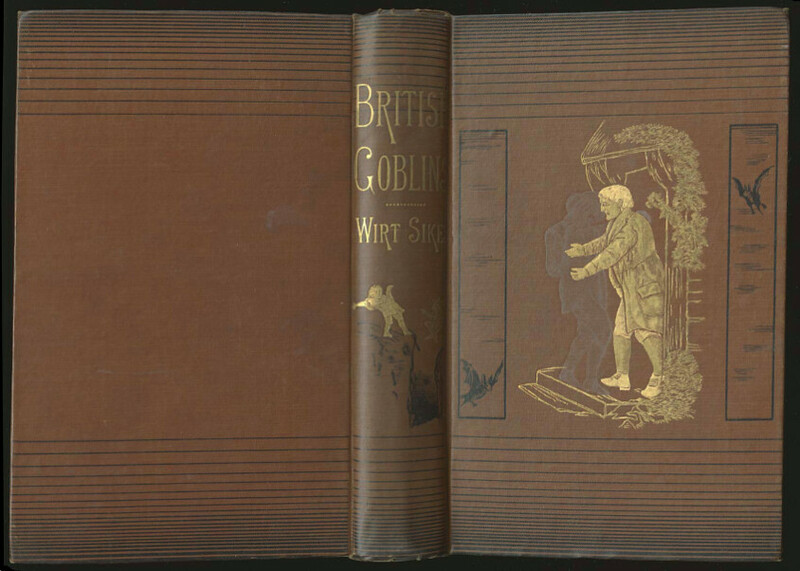 British Goblins: Welsh folk-lore, fairy mythology, legends and traditions, by Wirt Sikes; 1880; London: Sampson and Low. 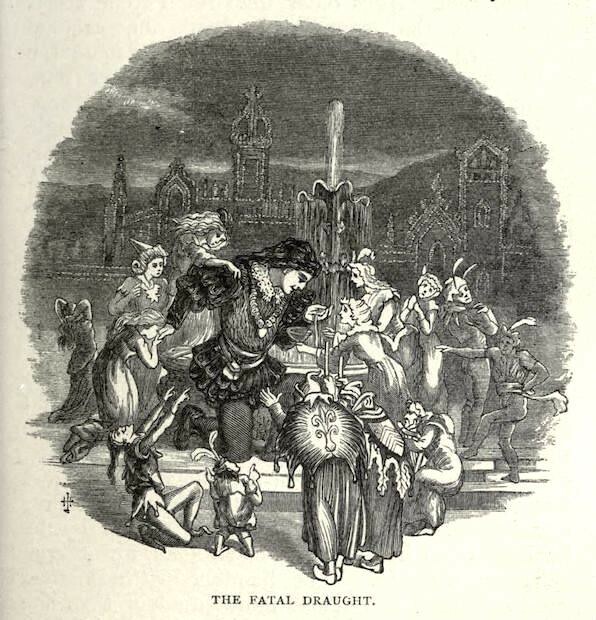 In British Goblins (1880) Wirt Sikes, the United States consul to Cardiff from 1876 to 1883, describes the mythology and legends of Wales, a land steeped in folklore. 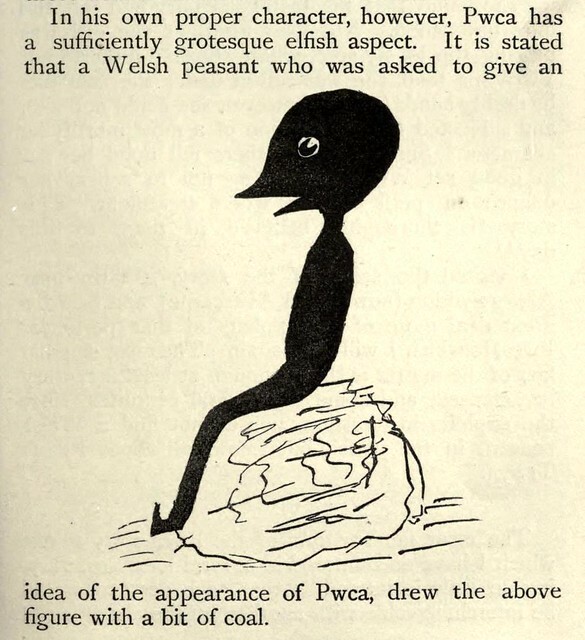 (Considering its geographic focus, why the book is not simply called Welsh Goblins remains a mystery.) 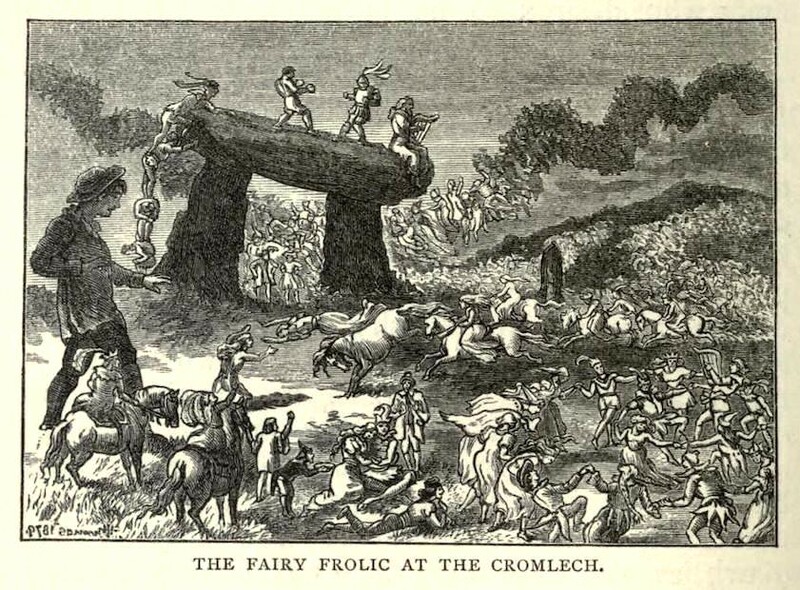 The first section of the book concerns the fairies, which are known as “y Tylwyth Teg” in Welsh, meaning the fair folk or family. They come in five varieties: Ellyllon (elves), Coblynau (mine fairies), Bwbachod (household fairies), Gwragedd Annwn (underwater fairies), and Gwyllion (mountain fairies). The Ellyllon are pigmy elves who haunt the groves and valleys. They dine on poisonous toadstools and fairy butter, which they extract from deep crevices in limestone rocks. Their hands are clad in the bells of the foxglove, the leaves of which are a powerful sedative. They are sometimes kindly, sometimes menacing and almost always mischievous. One variety of Ellyllon, the Ellylldan, will wait in boggy wetland and flash their fiery lures to lead travellers off the safe path, sometimes to their death. The Bwbachod are friendly goblins who will help you out with chores at home or on the farm, like making butter, if you behave correctly. That means making a good fire last thing at night and leaving a bowl of cream out for the Bwbachod to drink. It also means drinking a good deal of ale yourself, for the Bwbachod hate teetotallers. 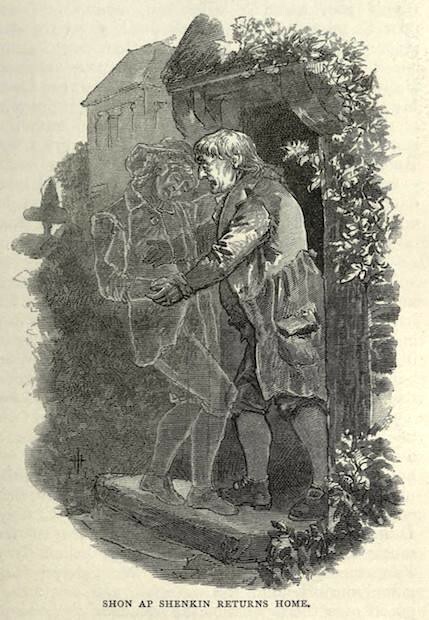 There was once a Baptist preacher in Cardiganshire who was much fonder of prayers than of ale so a Bwbach took to pestering him while he prayed: jerking the stool from under him; jangling the fire-irons on the hearth; making the dogs howl; frightening the farm-boy into fits of screaming by grinning through the window. At last the Bwbach took on the exact aspect of the preacher and confronted him as he crossed a field. The preacher fainted in fright. When he eventually came to he packed up and left Cardiganshire never to return. The Gwyllion are also female fairies. They haunt the lonely roads of the Welsh mountains. Like the Ellylldan, they have a habit of luring travellers away from safety. In stormy weather they will sometimes knock on a door and ask for refuge by the fire. To refuse them is to risk great harm. 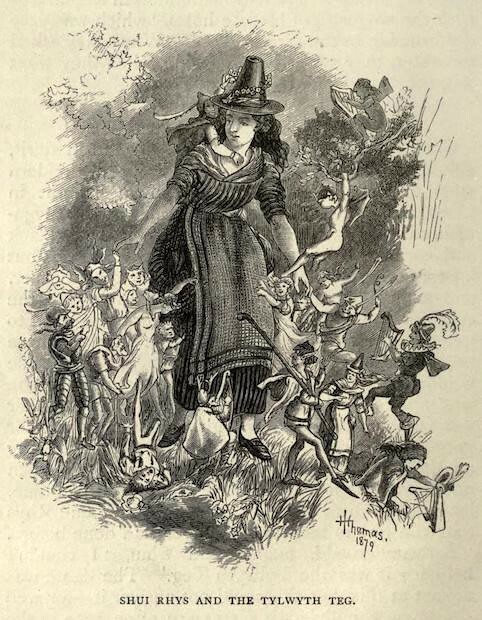 The second section of British Goblins departs fairyland and travels to the spirit world. Subchapters worth a dip include: Spectral Animals; The Gwyllgi or Dog of Darkness; The Stupid Medieval Devil in Wales; The Story of Haunted Margaret; The Corpse-Bird; and The Question of a Future Life. Section three concerns “quaint old customs” and contains insights into such matters as: The Spiritual Potency of Buns; Marketing on Tombstones; The Puzzling Jug; Welsh Morality; and The Sin-Eater. Section Four is all about “bells, wells, stones and dragons”. There you can discover: The Bell that committed Murder and was damned for it; The Gigantic Rock-tossers of Old; Obstacles in the way of Treasure-Seekers; Whence came the Red Dragon of Wales? ; and The Goblins of Electricity.